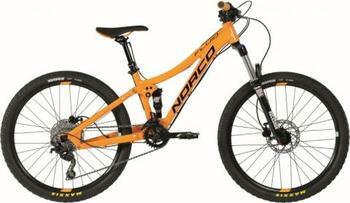 Norco Bicycles of Canada is recalling about 1,800 children’s bicycles with Samox cranksets sold in the U.S. and Canada. The cranks can bend or break during use, posing a fall azard. The firm has received four reports of the cranks bending or breaking. No injuries have been reported. This recall involves 2015, 2016 and 2017 model year Norco children’s bicycles with Samox SAC30-111NA square taper bicycle cranks in 140mm and 152mm lengths. The crank model number AC30 is located on the inside of both crank arms, and the crank length is stamped at the end of each crank arm. Included in this recall are 20- and 24-inch wheeled bicycles with the following model names: Storm 2.1, Storm 4.1, Charger 2.1, Charger 4.1, Fluid HT 2.3, Fluid HT 4.3, Fluid FS 2.2, and Fluid FS 4.2. The model name is located on the top tube of the bicycle. The bicycles, manufactured in China, were sold at Norco Bicycles dealers nationwide from May 2016, through September 2017, for between $400 and $1,700. Consumers may contact Norco at 800-663-8916 between 8:30 a.m. and 5 p.m. (PT) Monday through Friday, or visit the firm’s website at www.norco.com and click on “Safety Notices/Recalls” for more information. Consumers can also contact their local Norco Bicycles dealers to request installation of a new crankset.